They're branded as Victorinox. I don't have a Vic watch (yet ), but I do have two Wengers. 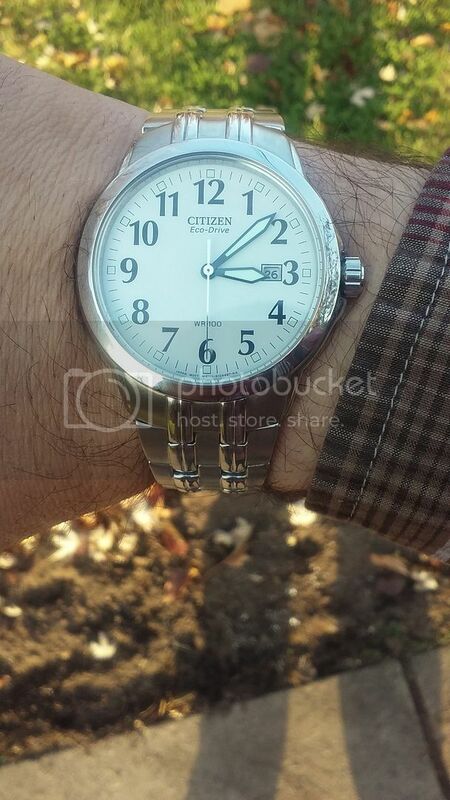 Several months ago I got my first Citizen Eco Drive. Great watch. No, that's not the current time or date. The pic was taken on Thanksgiving. Thank you! Why doesn't everyone do the same?! I bought several of those Swiss Military watches and gave them all away. Great little inexpensive beater watch. Didn't you have a digital watch too? Or did that one finally die? Seems to me you had that for a lot of years. It still lives, it was my at work watch as it had already taken a beating, so I wasn't worried about it getting scratched, or getting resin or other gunk on it at work. It's on the 3rd or 4th strap and probably similar for the battery. I got it via a coworker when I worked at Celestica in Toronto, she bought it at Costco on sale and it was too small for her husband's wrists (He was a pretty big guy). So... I've had it since... 1996 or so? I also have a number or WTI watches that I got during a newspaper promo thing... I really should go for a timelord badge, I have plenty of watches kicking around. Oooo an old Timex Expedition. I had one for years until it finally kicked the bucket a few weeks ago. I loved that beat up watch. I haven't actually used it since I stopped working at Gamesa about 2 years ago, it definitely needs another battery, and probably a thorough cleaning too... and a new strap wouldn't be a bad idea.